Festival venue: Kawaiaha‘o Church, on the corner of King and Punchbowl streets. I am excited to perform tonight in “Ke Ahe Lau Makani,” a festival of Hawaiian choral music with the Royal Hawaiian Band, and I invite to you come and enjoy. 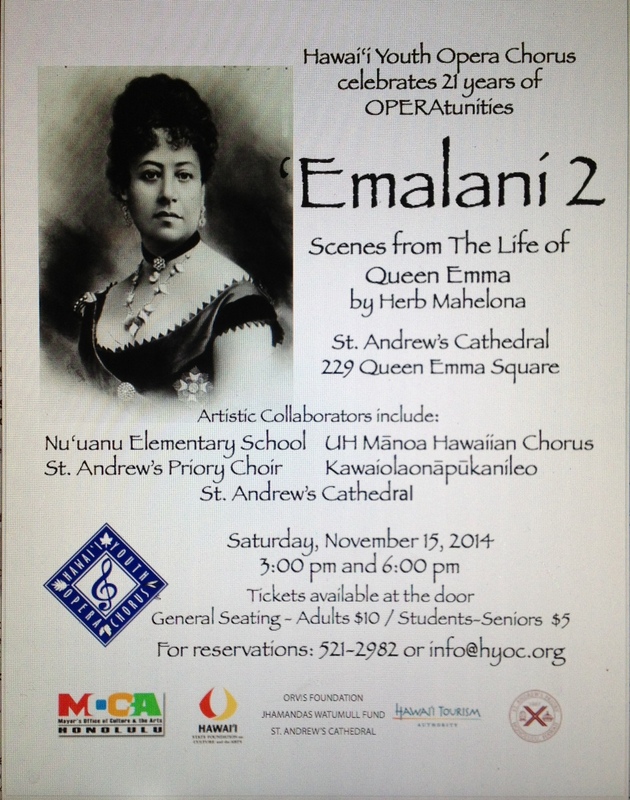 The downbeat is at 6 p.m. in the sanctuary of Kawaiaha‘o Church on King street across from city hall in Honolulu. There is no admission charge to attend. The Hawaiian Chorus of the University of Hawai‘i at Mānoa, the Gioventu Musicale Ensemble of the Hawai‘i Youth Opera Chorus, and the Kawaiaha‘o Church Choir. Indeed, it will be a joyous occasion to perform Hawaiian music written by famous composers of the past, namely Queen Lili‘uokalani, and contemporary composers and arrangers. This year’s festival honors and celebrates Prince Jonah Kalaniana‘ole for his birthday, the late composer Haunani Bernardino who gifted the festival with its name, and the late Dr. Kekuni Blaisdell who was on the core committee that initiated the collection of Lili‘uokalani’s mele, culminated in the printing of The Queen’s Song Book. When you come you will be treated to so much more story and translation of Hawai‘i’s past in a most historical setting. Please bring a friend with you to come and hear the music! Hard-working festival personnel are: Phil Hidalgo, festival coordinator; Nola A. Nahulu, artistic director; Buddy Nalua‘i, organist; Wendy Chang, pianist; and Clarke Bright, band master of the Royal Hawaiian Band. Mahalo!